Newspapers have struggled for years with declining readership and ad revenues, as advertisers gravitate to online sites. That's led to serious staff reductions industry-wide, and locally. About 75 Star Tribune employees have left or are leaving the paper, most through voluntary buyouts. Add the 20 or so Pioneer Press newsroom employees who took buy-outs last November, and you could have a pretty good staff to start a new online paper. "I'm thinking about it," says Joel Kramer, former publisher of the Star Tribune. "But I don't have much to say about it, because I'm just exploring it privately with people." Kramer said he's looking into launching an online digital daily in the Twin Cities sometime this year. "It's a challenging area," he says. "It remains to be seen if we can develop a sustainable business model and an exciting journalism model, but I'm talking to a lot of people about that right now." Kramer declined to say to whom he's talked, and he wouldn't comment on whether journalists could actually make a living working for his venture. Kramer hinted that his online daily would not employ the same business model as local papers. He's concerned about the effect of declining revenues and staff cuts on the papers' journalism. But Kramer also wants to avoid what he judges as mediocrity online -- the blogosphere. "Some of the blogs are interesting, there's a lot of it that's not," he said. "A lot of it is just pontificating, and I'm more interested in informed commentary as well as hard-hitting news gathering." Star Tribune correspondent and blogger Eric Black believes one can maintain high journalistic standards online. Black is taking a buyout and will soon be plying his craft through the Center for Independent Media, which runs online news sites including the Minnesota Monitor. Black says he's not taking a big pay cut, and is excited about the move. "Every single thing I can think of for me is better in the new medium than in the old. It includes the unlimited [space], the immediacy, the ability to interact with readers," Black said. Former Star Tribune restaurant critic Jeremy Iggers has also taken the digital path. He's working for the parent company of an online community newswire and syndication service, called the Twin Cities Daily Planet. There are now enough people delivering news on the Internet to support a trade organization called the Online News Association. Executive Director Laurie Schwab says about 45 percent of the group's 1,100 members started working at print publications and migrated online. That number includes people who work for a newspaper's Web site. "Many people simply receive their first job in print and then move online, because of the opportunities. However, as time goes on, there are more and more journalists who are starting in online publications or digital delivery publications," Schwab said. Former New York Times regional columnist Debbie Galant is part of the migration. She used to write about New Jersey for the Times, but was laid off. She ended up launching a hyper-local news site that covers three towns. On Wednesday afternoon, the site featured items about a local store closing, the Frisbee's 50th anniversary, and two local elections. The site claims 5,000 daily visits. Galant said that's to the chagrin of her competitors, which include five local weekly papers, three free magazines, and a few regional papers. "There is some hostility from the local print media towards us, because we are taking away ad dollars. We get a lot of attention," Galant said. "They'll make disparaging comments that we're not as professional as they are, and we're not doing the serious game of journalism the way they are." 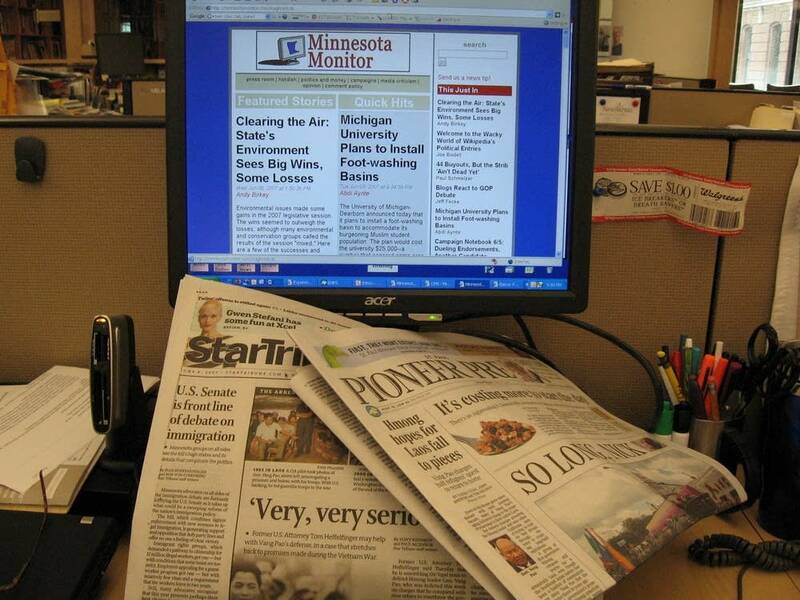 Some Twin Cities area journalists voice similar complaints about news offered by Web sites that aren't paired with a print or broadcast operation. But those complaints may dwindle if more newspaper reporters migrate to online-only sites. As for Debbie Galant, her Web site isn't totally paying the bills yet. She says she makes more money as a novelist. At the Star Tribune buy-out takers include big names from the paper, such as columnist Doug Grow and reporters Conrad deFiebre, Sharon Schmickle, and Chuck Haga. Editor Nancy Barnes' e-mail to the Star Tribune staff suggests that some buy-out applications are still under review. Newspaper Guild officers believe there were more applications than anticipated, especially among reporters. A newsroom reorganization plan should be out before the end of the week, according to Barnes.